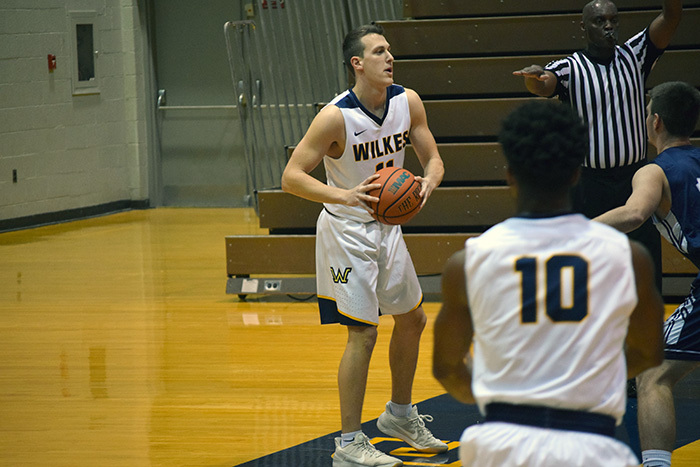 WILKES-BARRE, Pa. — The Wilkes University Colonels used a huge second half Saturday afternoon to beat the King’s College Monarchs 76-64. In the process, the Colonels picked up their sixth win in seven games, and they improved their conference record to 5-1. The Monarchs dropped their third conference game and now sit at 3-3 in the MAC Freedom. King’s came into this game hoping to jump up the conference standings with a big win following a tough seven point loss to the MAC Freedom’s current leader Misericordia. This game started out with Kings dominating the first half. The Monarchs pressured the Colonels and put two guys on the ball. The pressure forced the Colonels to make errant passes and miss shots. As the game played on, the Colonels settled in and kept the game from getting out of reach. The second half was a different story as the Colonels came into the half trailing 38-30, but quickly found the game tied five minutes into the half. The second half was all Colonels, as they showed the Monarchs what they can really do with an explosive second half. They took the lead around the 15-minute mark of the second half and did not trail again in this game. The Colonels used big games from Zach Brunner, who had a game high 17 points, and Mark Mullins who recorded a double-double with 13 points and 16 rebounds. Colonel star Marcus Robinson also used his game breaking ability to shift momentum in this game in his teams favor with big three-pointers and some big steals. The Colonels toughest test is on Wednesday though, when they take on first place Misericordia in Dallas, Pa. The Colonels will look to keep their winning ways going with a win in this very difficult match-up.